As a certified septic system installer and inspector, Legacy Septic wants to share with you the following information regarding Septic Systems. We are also a Maryland licensed Sand Mound Installer with continuing education in alternative systems and are ready to provide perc tests when necessary. Septic systems treat and disperse relatively small volumes of wastewater from individual or small numbers of homes and commercial buildings. 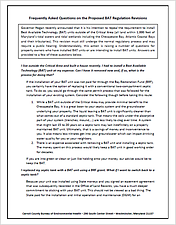 Septic system regulation is usually a state and local responsibility. EPA provides information to homeowners and assistance to state and local governments to improve the management of septic systems to prevent failures that could harm human health and water quality. 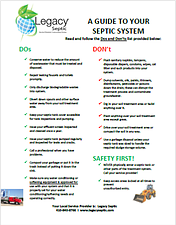 Legacy Septic recommends that every septic system be checked before purchase and every two years thereafter. ​Once you’ve signed your contract, Legacy will contact your local County Health Department and request your properties septic system records, this can sometimes take up to two weeks for us to receive your records, unless it is an emergency. When we have your records, we will contact you to schedule your appointment. On the day of your service, we dispatch our technician to pump the septic tank. He will draw a map of the septic location along with any unusual circumstances including the amount of hose needed; he will also take measurements and note any concerns. It would help us to know how frequently you pump the septic tank. Our expert technician will review the notes & measurements made in your property file and will make any recommendations or concerns if necessary. A few weeks later, you’ll receive a packet contacting a blue folder as suggested by the Maryland OnSite Waste Water Professionals, along with your County Record and other pertinent information. We’ll also note our service date which we encourage you to record each time we service the property.